I am here to say that I love myself a gallery wall! Gallery walls and me were kind of a match made in heaven, if I do say so myself. Do you love gallery walls too? If so, then this is the post for you! 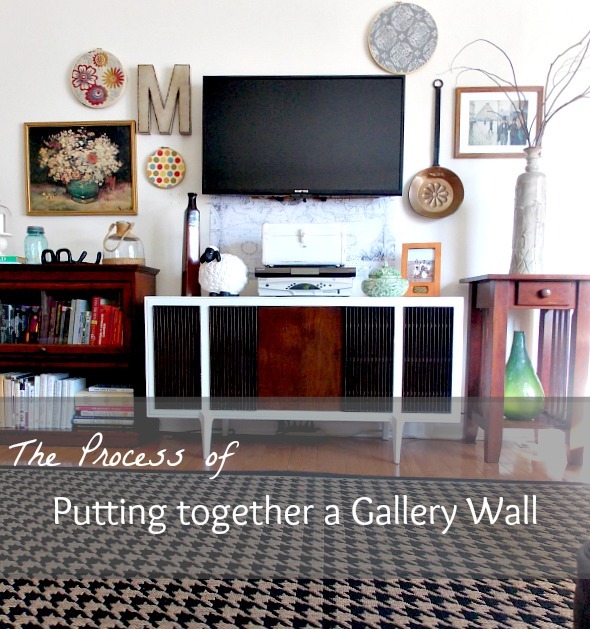 I am going to share my thoughts and my process for putting together a gallery wall. Now if, like me, you are a connoisseur of the gallery wall, you have probably read many different ways of going about one. And I have probably used some of these ways myself. I also have a Pinterest board dedicated to Gallery Walls if you would like to follow it. For this post, my focus will be the gallery wall that I am in the process of creating around the TV in my living room. You may have seen some sneak peeks of this wall here and here if you are a regular reader. But this is the first time I am revealing the entire wall on the blog. If you would like to see some other awesome TV gallery walls, check out this post. In the past, I have used paper templates in the same shapes as my objects that I plan to hang, and hung them all on the wall using tape, kind of like this pin. I have also taken everything that I plan on hanging on the wall and laid it all out on the floor first, kind of like in this pin. Both of those methods have worked very well for me. And I would definitely recommend them both. But how do you start on a gallery wall? How do you know what to hang on a gallery wall in the first place? That is a good question, don’t you think? First off, I want to say that I am no professional designer, and certainly am not an expert! If you are looking for an expert on gallery walls, go read Emily Henderson’s blog! Which, I might add, I read on a daily basis, and I learn so much from her! But in my humble opinion, I think a gallery wall should be a collection of interesting art pieces, photographs, objects, fabrics, and colors that are personal and meaningful for you. A gallery wall does not happen in a day. When I am planning for a gallery wall, I might collect objects for it for 6 months, a year, or even two years! And sometimes I get anxious and go ahead and hang what I have so far, and then add more things when I find what I am looking for- which is exactly what I have done with this particular TV gallery wall. I have had this stuff laying around just waiting to be hung on this wall. But I was waiting until I paint the walls (still not done BTW). But after I made over this awesome MCM record player for underneath the TV, and we actually got a new TV and hung it, I just couldn’t resist hanging the gallery wall. I figured I would try it out now, before I paint, and if I don’t like it I can easily fill in these tiny holes when I do paint. And if I do like it, I can recreate it (that is the good thing about blogging- I have pictures)! For my family room gallery wall, I laid everything out on the floor first. For my hallway gallery wall, I hung the paper templates first. But for this wall, I just started hanging things where I thought I wanted them. I did have LC hold a few things up while I stood back and eyeballed it, and then hung it. The first thing I hung on this particular wall was the flower painting to the left of the TV. I knew I wanted it to be centered over my bookcase. The next thing I hung was the pan with the long handle to the right of the TV. And then I just kept hanging things, one at a time, until I liked the result. But I did have LC hold each thing up first so I could make sure I liked where it was going, and I just marked each spot to nail with a pencil. I think the very first item I collected for this particular gallery wall was the letter “M”. LC brought this back to me from a trip to Charleston, SC. And in case you are wondering, the M is meaningful because my two oldest children’s last names begin with an M. I bought the embroidery hoops from Goodwill a long time ago, and collected the different fabrics over time. The grey and white fabric is from a cloth napkin I purchased at Target, and the polka dotted fabric is from my DIY no sew curtains in the kitchen. This vintage looking art print was purchased with no frame from Goodwill. I put it in this frame, which I happened to have lying around. Not sure if it will stay in this frame for the long haul or not. The “pan thingy” was purchased on a trip to Amish Country last spring. I do have plans to modify this a bit, but you will have to wait to see what my plans are. My biggest inspiration, and maybe my most favorite thrift store find ever, is this Van Gogh print that I purchased for 50 cents. The actual painting is called Vase with Zinnias and Other Flowers. For a long time I had this leaned up against the wall in this room, and I was happy to finally hang it up! It barely fits into this frame, but there is just something about the print with the frame that I totally dig, it is totally my jam! Another thing I wanted to point out to you is the map underneath of the TV. It is actually hiding something really ugly. Our old TV was actually hung down that low. I wanted it raised up about a foot, so there is a big orange rectangle from the previous owner’s living room paint color under that map. This map is actually wrapping paper that I bought at Marshall’s several months ago, knowing that I would use it for something. And this seemed like the perfect something to use it for! So the map wrapping paper is a temporary solution to an eyesore, but actually I kind of love it! And so does LC, so even after we paint, it may make a reappearance on this wall in some form. But this is an easy and cheap solution to cover an unsightly spot on your wall. You can also read more about the vintage vanity case sitting on the cabinet here. The most recent addition to my TV gallery wall is my new DIY book page wreath. I still plan to add a cute bow to this wreath, but haven’t had time to shop for ribbon yet. Obviously, the hearts on the tree were there for Valentine’s Day, which is when I took the pictures. But who am I kidding? they are still there and probably will be until the end of February. I decided to hang the wreath centered between the grandfather clock and the little side table. It is a little further away, but eventually I will add something small in there to make it come together. I chose an oval shape for this wreath because I already had three circle shapes on this wall, and I wanted a different shape. I think the oval worked out nicely. So there you have it! My TV gallery wall in progress! I still need to add something significant over the TV, but I haven’t came across the perfect thing yet. And I am sure there will be some little odds and ends that I add to the wall over time. But as I said above, a gallery wall doesn’t happen in a day! It happens as you collect things over time. I think it is OK to go ahead and hang what you do have on the wall if it is a significant amount of stuff to get started. And after that you can add things. I actually like doing it this way, because I know what spaces I still need to fill now, and I have an idea of what size things need to be. So when I am out shopping, I will have these things in mind when I look. I usually don’t go shopping with any particular gallery wall in mind though. I come across things and just know they will work, and then I buy them! If you love gallery walls, but are afraid of them a little, or don’t know where to even start with one, I hope this post helped you gain some insight today. Just start collecting things on your shopping adventures, or from thrift stores or vacations. Use photographs of loved ones. find that one inspiration piece that will help you define that wall. I will all come together perfectly in time. I think a gallery wall is so personal and no two are ever the same. So as long as you like the things that you have collected, your wall will turn out perfectly for you!